Sure to be a BLAST! Come and join the kids and families of 12 Oaks at Kevin and Stacey Leonard’s home November the 11th from 6:30-8:30. There will be lots to do and great fellowship. 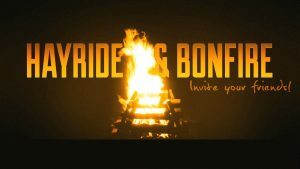 Fall is the perfect time for a hayride and who doesn’t enjoy Smore’s around a fire? For directions don’t follow the smoke, just see The Leonards or Nick Dixon and we will get ya there (88 Liberty Church Rd. Hickory KY 42051)! PLEASE BRING YOUR OWN LAWN CHAIR. Invite friends and we will see you there.